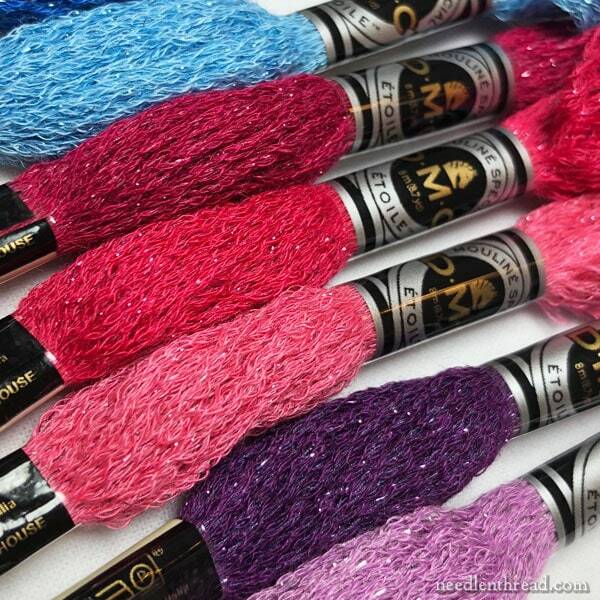 DMC’s newest thread is Etoile, a blend of floss and metallic initially available in 35 colors. Primarily aimed, I think. at cross stitchers and those who do hand embroidery, it comes matched to SMC floss colors. If you combine floss and metallic in one needle, this thread is a solution. it’s also DMC’s entry into the popular base thread with metallic style. Mary Corbet of Needle n’Thread has an article with her first look at Etoile.In it you’ll learn about the thread’s construction, colors, plus a bit about stitching with it. I’m looking forward to seeing her review.